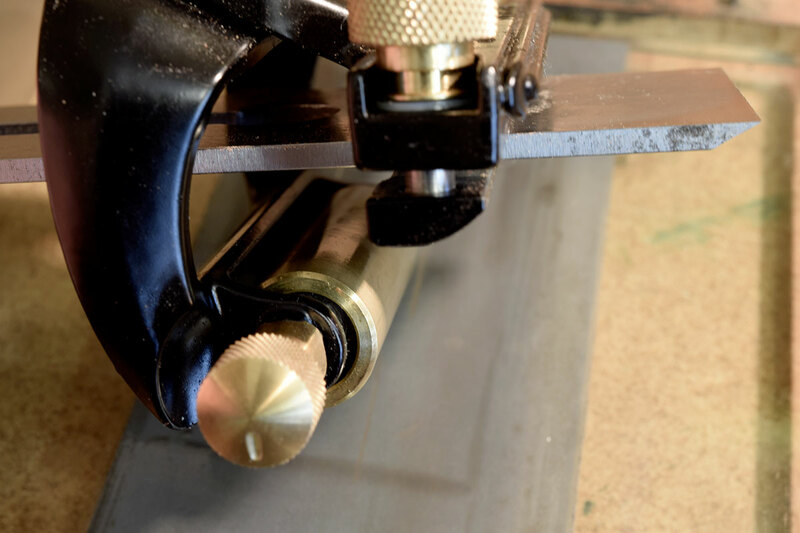 In an earlier article, I spent some time examining the overall strategies required to hone an edge on a plane or chisel blade and this entry looks in more detail at the Veritas Mk.II Honing Guide together with the Narrow Blade Head. 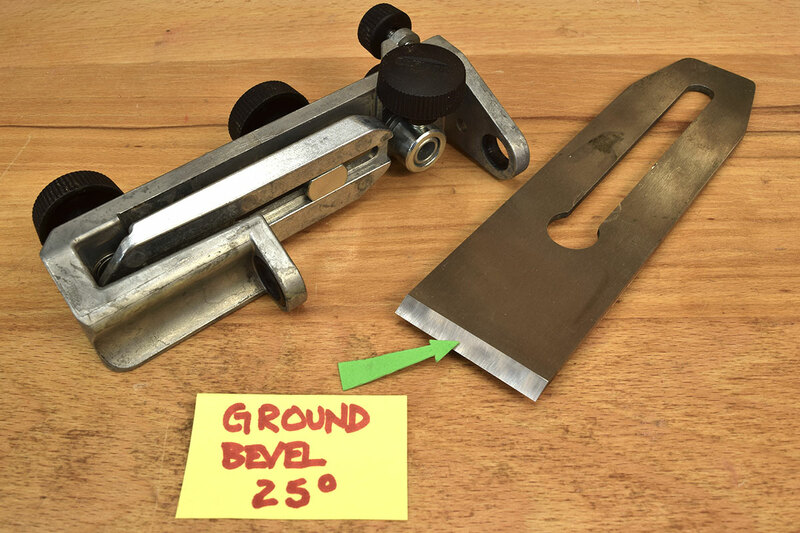 Firstly, dealing with planes, I removed the 50mm blade from my Rider No.4 and ground a fresh 25° bevel on it (arrowed) using the Tormek SE77 jig. 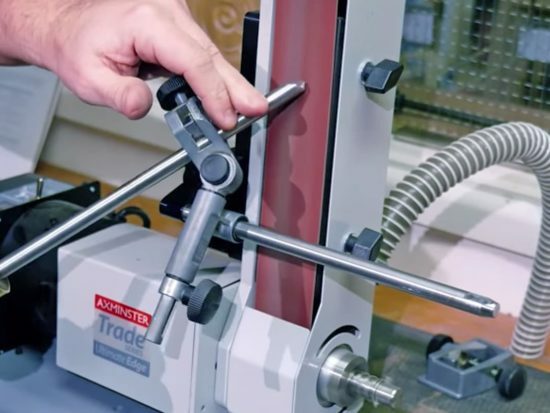 Following the excellent instructions included in the box, the basic guide is very easy to set up to hone a 30° bevel (arrowed), remembering to initially set the Micro-Bevel Knob at the 12 o’clock position. 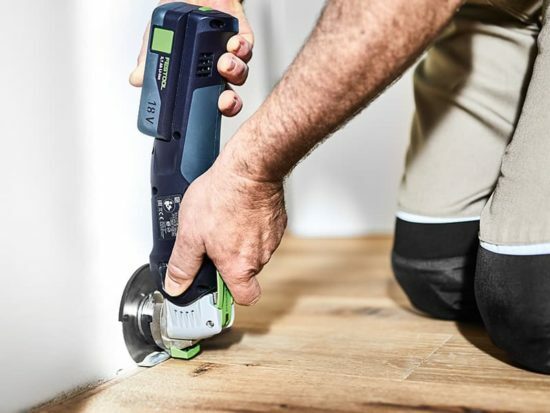 When the freshly ground blade is inserted against the Registration Stop, already fitted into the guide, it’ll be set to hone a bevel of exactly 30°. 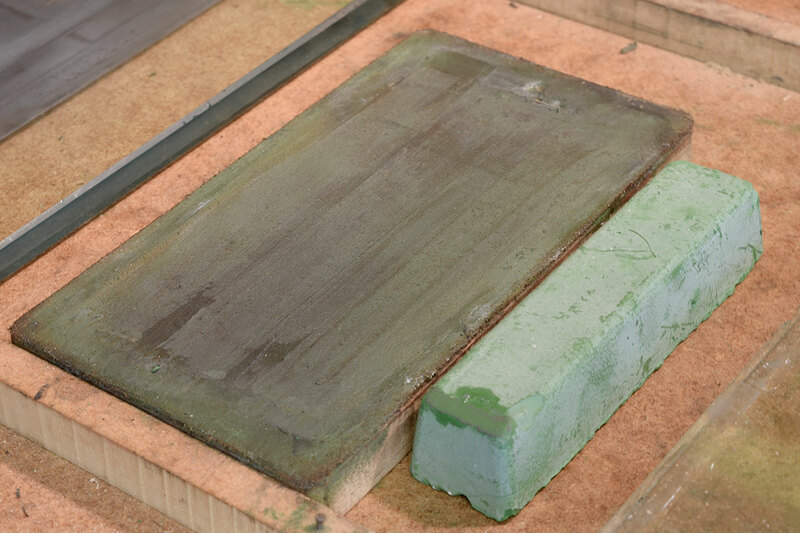 I use 3M films for the so called ‘Scary Sharpening’ process, in particular the grey 9 micron (about 1200g), brown 5 micron (2,500g) and green 1 micron films, which is equivalent to around a 11,000g Japanese waterstone. 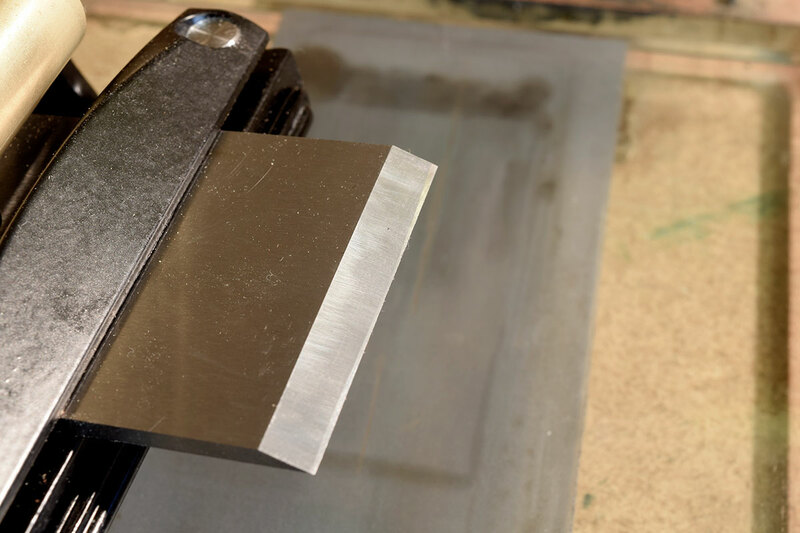 The initial 30° bevel is established on the 9 micron film and shows as a very thin, polished line along the edge of the blade. This is useable but nowhere near fine enough, so it now needs to be refined and polished. The next step is to remove the burr produced from the 9 micron film and at the same time, add a micro-bevel of around 2° as well as polishing the reverse side (or back) forming a very narrow ‘back bevel’. Firstly, rotate the Micro-Bevel Knob to the 6 o’clock position. This has the effect of raising the honed edge by around 2°, thus creating a polished micro-bevel using 5 and finally the 1 micron films. 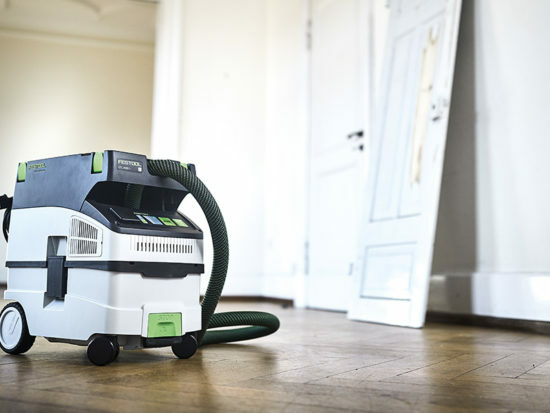 The films are lubricated with a squirt of WD40 and the honing progress can be judged by the black swarf which appears ahead or behind the blade. The ‘pull’ stroke is recommended with these very fine films as they are liable to tear easily. 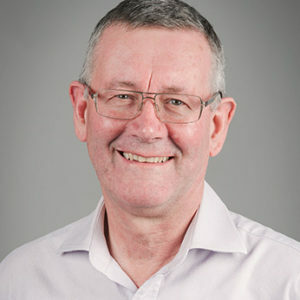 after which the blade can be stropped if required. I use a thick piece of sole leather stuck to an mdf baseboard, which is then dressed with a smear petroleum jelly. Veritas Honing Compound is applied next and worked into the leather’s surface. 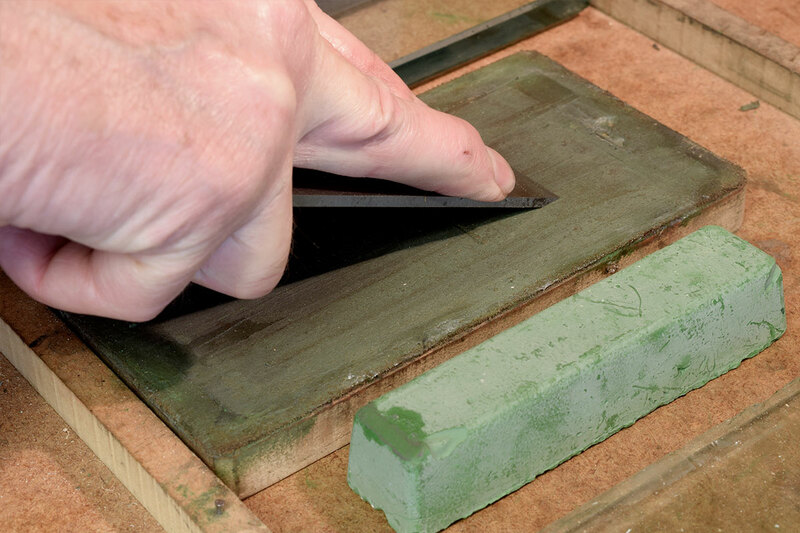 The honed edge is pulled back on the strop a few times, further refining the micro-bevel, making sure afterwards to clean off any accumulated stropping residue with a piece of rag. 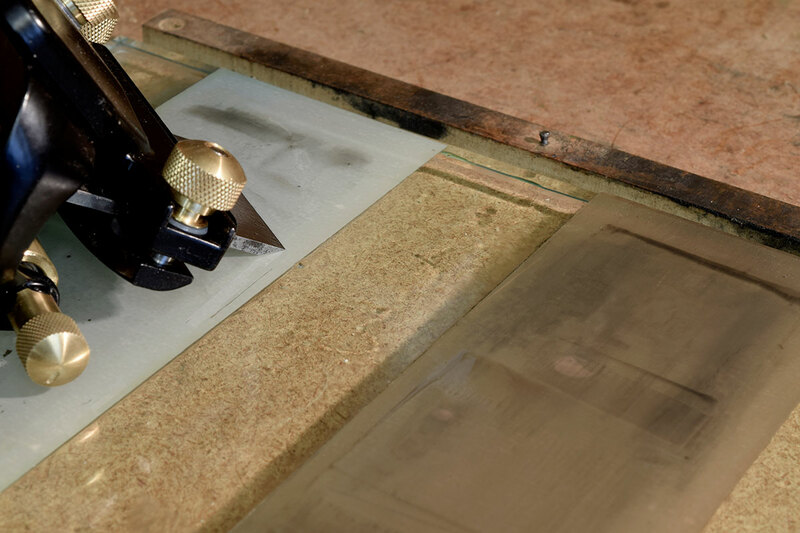 The blade is then flipped over and the back bevel is given a final polish using the 1 micron film, which should be around 1mm or 2mm wide at the most. 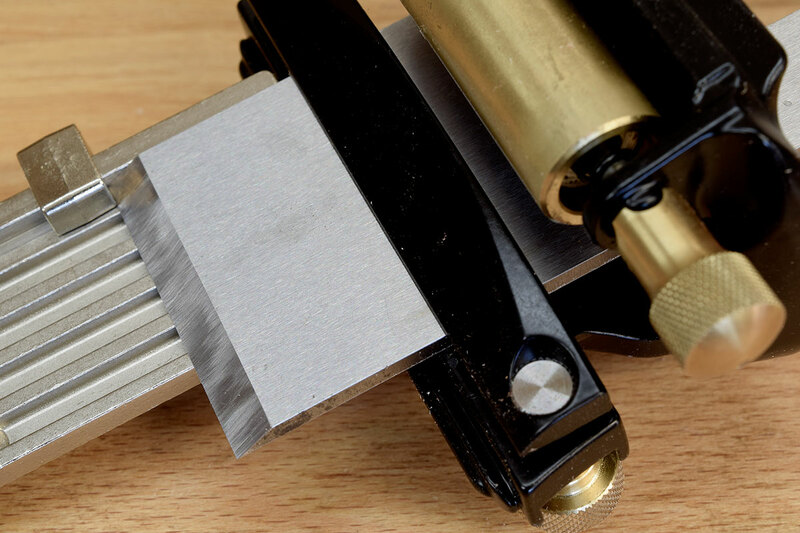 Chisels are sharpened almost identically but using the Narrow Blade Head which is best used for smaller width blades, say 12mm or 10mm and under. Wider blades can still be held in the standard guide or the Narrow Blade Head; it’s just down to personal preference but trying to hold narrow blades in the standard guide is liable to be a precarious business! 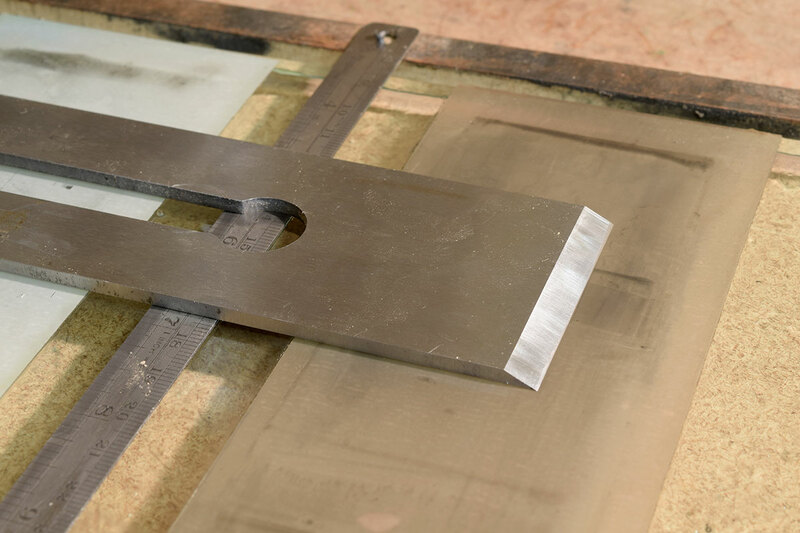 Having fitted the Narrow Blade Head and Registration Jig (set to 30° arrowed), remember also to re-set the Micro-Bevel Knob back to the 12 o’clock position; it’s very easy to forget and if you do, the wrong angle will be honed. 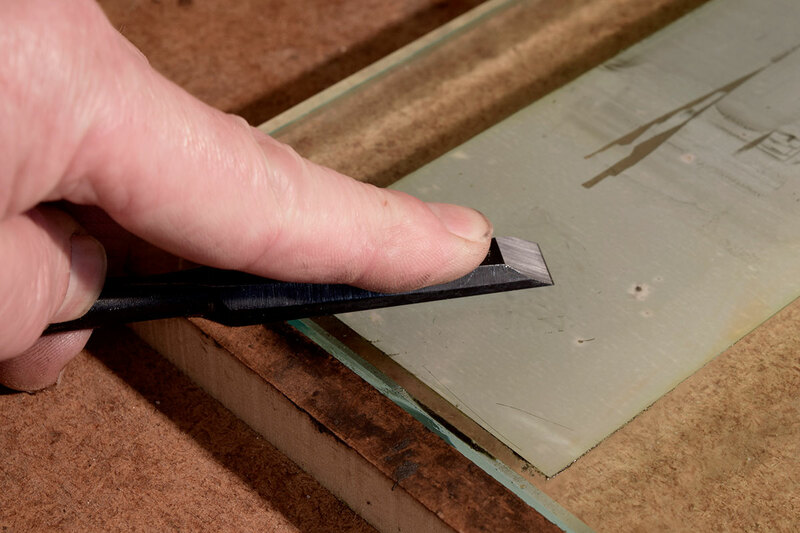 Chisel blades can be stropped (or otherwise) but the back of the blade must always be polished flat on the finest films; the ‘Ruler Trick’ must never be used as the back bevel produced may cause inaccuracy when it’s used. 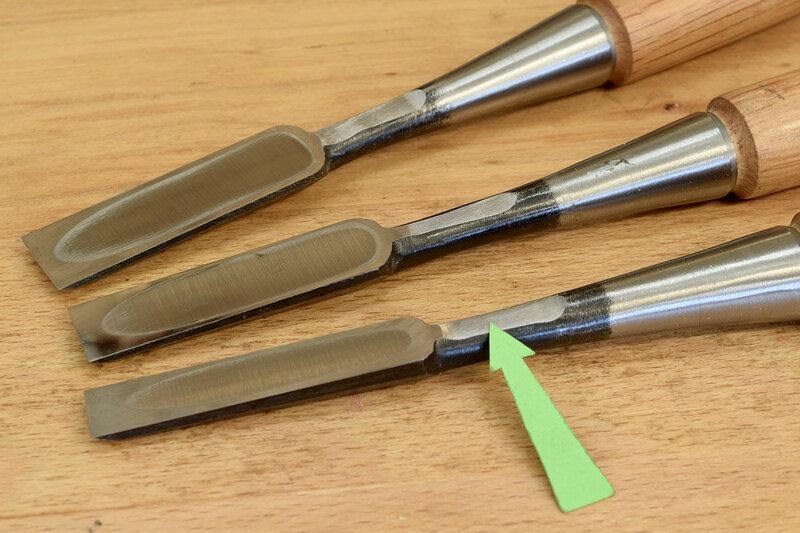 When the back is polished on short Japanese chisels, the very thick neck of the blade can often foul the edge of the sharpening medium. On my chisels, I’ve ground away a section (arrowed) so this doesn’t happen, much to the complete horror of some of my Japanese tool wielding friends where this sort of unbridled vandalism is a complete anathema. It’s evident that this sort of honing process is fairly long winded and involves working down through the various grades of film, but once you have a routine that you’re comfortable about, it doesn’t actually take too long and produces a really lethal edge….but how lethal? This is difficult to quantify, but unless you have a particular attraction to plasters or you habitually like visiting A&E, you’re well advised never to shave the hairs off your arms or to try the edge out on your finger tips. Instead, find an oddment of nasty, soft pine and take off some shavings from one of the corners; the chisel should cut effortlessly through the wood and leave a polished surface behind it. 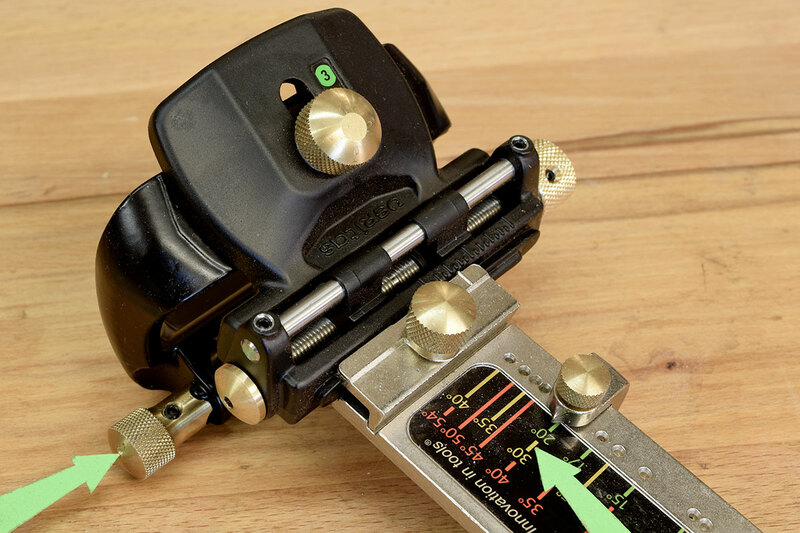 If there are any questions about my particular method of honing, please leave a comment below and I’ll do my best to answer your query.